A few months ago, HuffPost, the world's most-read online "newspaper," debuted its entry into video "news," HuffPost "Live." Some (including us) initially dismissed it as merely Arianna's equivalent of a continuous gab-fest talk show; a merging of "The View" with "Jerry Springer," and a bit of Chris Matthews' neck-bulging hysteria thrown in for good measure. Big mistake. How the Huffington Post gets away with placing someone who vocally campaigns for this morally corrupt position in a role of senior responsibility, is simply beyond me. To present a more passive stance against Iranian nukes and call for the extension of diplomatic efforts is one thing. It is quite another to stand behind a terror sponsoring regime that is guilty of incitement to genocide, and blame its victims. 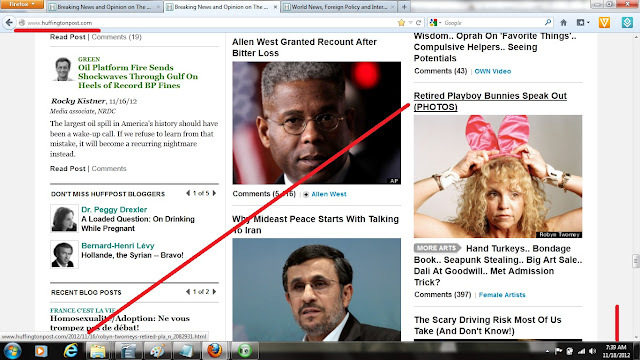 If The Huffington Post seeks salvation; the bad apples must be cast away. Absent a thorough house cleaning, readers be warned: Arianna has created a mouthpiece for the devil. That got us curious: Who is Shihab-Eldin? And why would HuffPost enable such a vicious pro-Hamas, anti-Semitic propagandist to anchor and produce its flagship video "news" product? It wasn't until November 16, though, that HuffPost apparently decided to completely unleash Shihab-Eldin to (a) spew a breathtaking range of untruths, distortions and outright lies against Israel, while (b) completely ignoring the facts that obliterate his arguments. In total, his acts could only serve one purpose: to protect Hamas, and falsely vilify and incite hate against Israel. 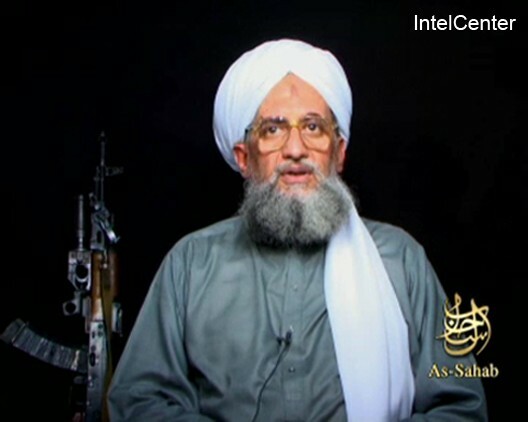 This is no anomaly; Shihab-Eldin is merely the newest face of what we've been documenting for four years: HuffPost's relentless effort to facilitate the cyber-jihad against the U.S. military and Israel and Jews --- while ignoring, whitewashing or downplaying the savage acts, threats and statements of militant Islamists. Today, HUFF-WATCH debuts our first, overdue feature that focuses exclusively on HuffPostLive. After reading this, you will know why Hamas, Al Qaeda, Islamic Jihad and all their savage terrorist brethren must be delighted that Arianna has now found a new, extremely powerful means of advancing their mission. And the best part? YOU are helping to pay for HuffPostLive, via your tax dollars. "Terrorizing Gaza: Will Egypt Intervene?" Journalist Mohammad Omer, who is living in the Occupied Gaza Strip, provided us with live updates from the Rafah Refugee camp. "There are 248 people who were injured, among them 148 children and women injured by the airstrikes," Omer said. "The airstrikes are continuing as we speak. There is a humanitarian crisis in the Gaza strip. There is nowhere to run. There is no shelter." Let's focus first on the title of this screed: Is Gaza really being "terrorized" --- and if so, by whom? The only parties that are "terrorizing" the residents of the Gaza Strip are Hamas and other Islamist terror groups, who relentlessly target and attempt to murder Jewish civilians, most recently through the estimated 900 rockets, missiles and mortars that they've fired into Israel since early November. They alone are forcing Israel to retaliate, to stop rockets from raining down on its civilians. Yet as we documented here and here, if you rely primarily on HuffPost for your news, you wouldn't know anything about the hundreds of rockets that Hamas fired against Israel between Nov. 10-14, because it published not a single story on its front page or World page about them. 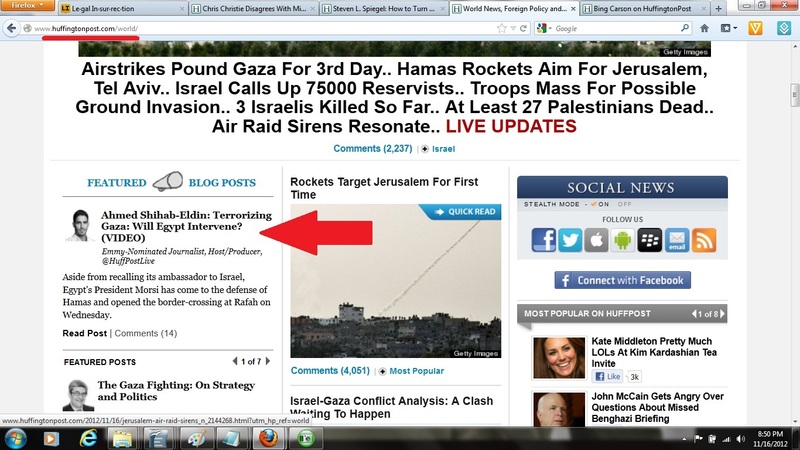 HuffPost only jumped into action when Israel began threatening to begin "targeted assassinations against Gazans." This omission is no anomaly; for the past four years, HuffPost has been protecting Hamas and doing its PR, while simultaneously publishing inflammatory lies about Israel and Jews --- just like this one. 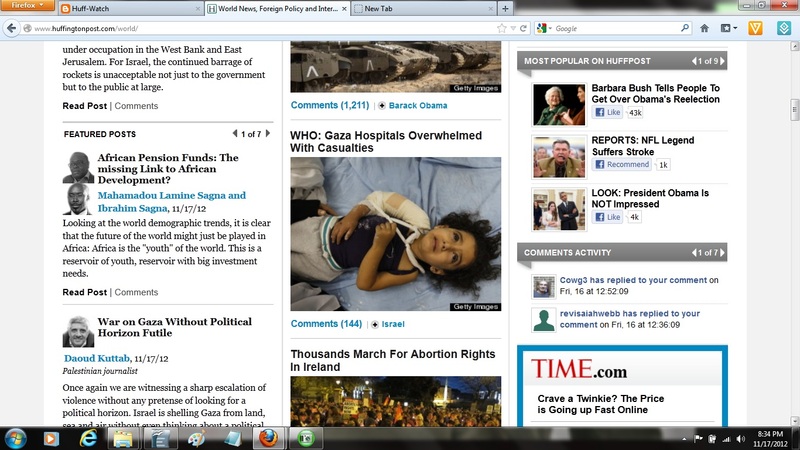 Second, the Gaza Strip is not "occupied." That is a particularly vile lie, that could only have been concocted by Hamas --- or one of its media propagandists. There is not a single Jew in the Gaza strip --- and with one exception, there haven't been any there since 2005, when Israel completely withdrew from the region. The lone exception was Gilad Shalit, the IDF soldier that Hamas kidnapped and unlawfully held for five years, without allowing him a single visit from the Red Cross or any "human rights" agency. Third, who is this alleged "journalist," Mohammed Omer, whose incendiary allegations about women and children being injured by Israel's surgical strikes against Hamas targets Shihab-Eldin accepts at face value? And what about his lie that "There is nowhere to run. There is no shelter" in Gaza? The reality is that Omer is not a "journalist" --- he is a pro-Islamist propagandist with Electronic Intifada, which, as NGO Monitor has documented, is so biased for Hamas, and against Israel and Jew,s that it makes Al Jazeera look like the Wall St. Journal. (More: 1, 2, 3) And as honest observers know, the only "journalists" that Hamas allows to live in Gaza are those that it knows are willing to spread its propaganda. The fact is that Israel employs super-human measures to ensure that only Hamas targets are hit, and even air-drops leaflets and makes millions of phone calls urging Palestinian civilians to stay away from Hamas installations that will be targeted in their area. How many other armies in the world go to such an extent to avoid civilian casualties? Further, President Morsi of Egypt has vocally stood by Hamas, and opened the border to Egypt for refugees. 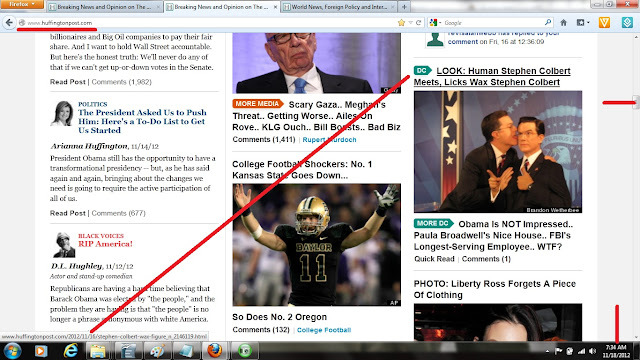 HuffPost decided that none of those facts, however, were worth mentioning. Just as it decides in pretty much every case concerning inflammatory lies against Israel and Jews. But wait, didn't Arianna Huffington publicly announce that she prohibited "inflammatory claims" at her site? Why yes, she did, years ago. That, however, is just another of the lies that she has pathologically tells the public, and presumably, her advertisers (including your tax-funded Cadillac -- the official co-sponsor of HuffPostLive). 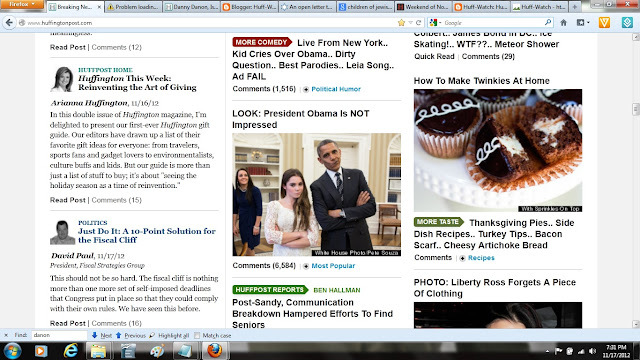 Anyone who spends a minimal amount of time at HuffPost knows that it is very image- and video-centric. If it can obtain a imagery (especially video) of anything that advances the cyber-jihad, it is rushed to the front page, where it will stay for a good while. In some cases we've documented, HuffPost even outdoes Al Jazeera in terms of inciting hate against the U.S. military, Israel and Jews, based on what it knows (or should know) is false information. Keep that in mind when you consider the fact that on November 15, one day before Shihab-Eldin's latest screed, a video produced by Honest Reporting showed Hamas using the BBC to stage completely phony Palestinian "injury" video (also known as "Pallywood" propaganda). Basically, the BBC video purportedly shows a grievously injured, unconscious Palestinian man being carried away... yet a few minutes later, he is (miraculously!) awake, and is (miraculously!) completely uninjured!!! This video went viral among conservative and pro-Israel blogs. 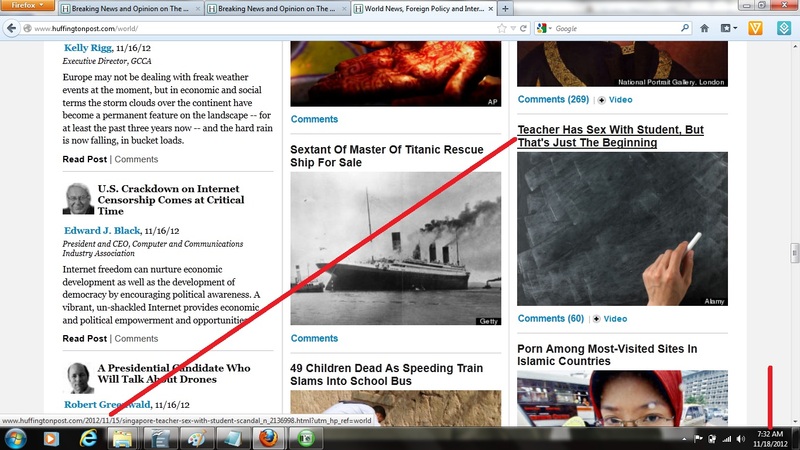 Even CNN retracted it. So how did HuffPost (and HuffPostLive) react to this exposure of the depths to which Hamas works to perpetrate fake injuries and deaths, in order to elicit world sympathy? Yet even Palestinian sources on the ground admit that there were no IAF strikes in the area at the time this boy sustained his fatal injuries. 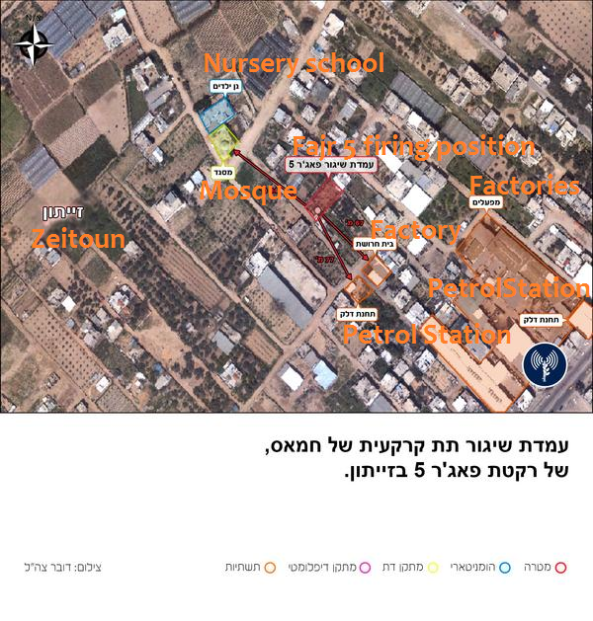 Soon thereafter, it was discovered that a significant minority of the rockets that Hamas has been firing at Israeli civilian centers fell short, and landed on Palestinian homes, instead --- and this was one of them. Other blogs, including Breitbart.com, revealed this hoax. 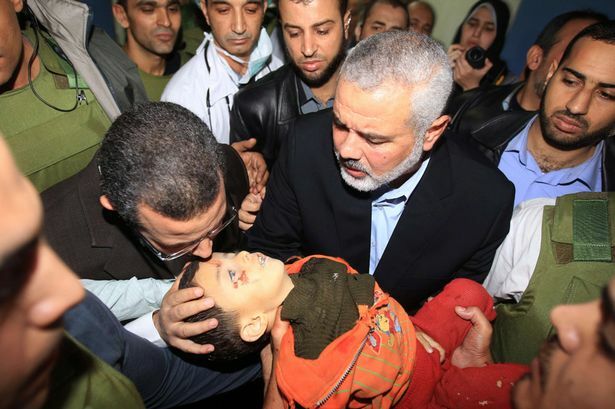 The Telegraph (UK) issued a retraction, and admitted that it was a Hamas rocket that killed this little boy. 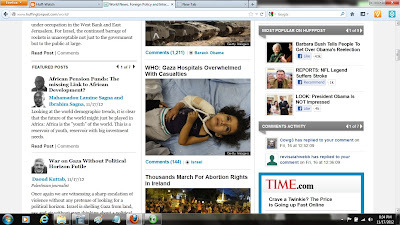 Yet as we and our friends at HuffPostMonitor document, HuffPost never, ever publishes pictures of injured Jewish children. From the Tablet, with detailed reporting at Breitbart. Basically, Hamas used its official Twitter account to send out the following heartbreaking image, which it alleged was one more casualty of Israel's reckless attacks on Palestinian civilians. 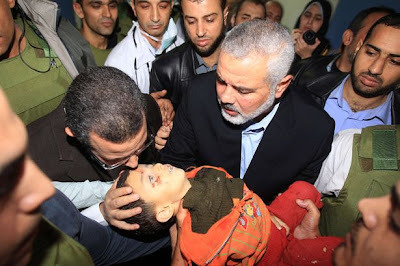 One little problem: the child was killed by Syrian forces, in Syria; Israel had absolutely nothing to do with it. 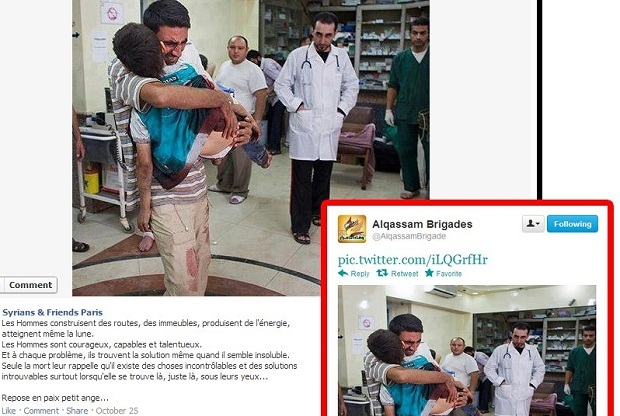 HuffPost Live (and HuffPost), however, completely ignored the evidence of this latest Hamas hoax. On Saturday, Hamas aired a propaganda clip on its television station threatening in Hebrew to resume suicide attacks in Israeli cities. For years, HuffPost has routinely posted on its front page what it claims are "outrageous" statements by Israeli politicians --- yet it never posts any of the genocidal threats like this by Hamas, the terror group that it routinely protects and emboldens. So in this case, what did HuffPost decide was more "newsworthy" to put on its front page, and World page, instead of this genocidal threat? You get the idea: HuffPost judged a psychotic starlet's "bathtub striptease" (above) and similar nonsensical "news" stories to be more important to place on its front page than a single story that demonstrates the savage reality of Hamas, and the #TerrorStateOfPalestine that it runs. 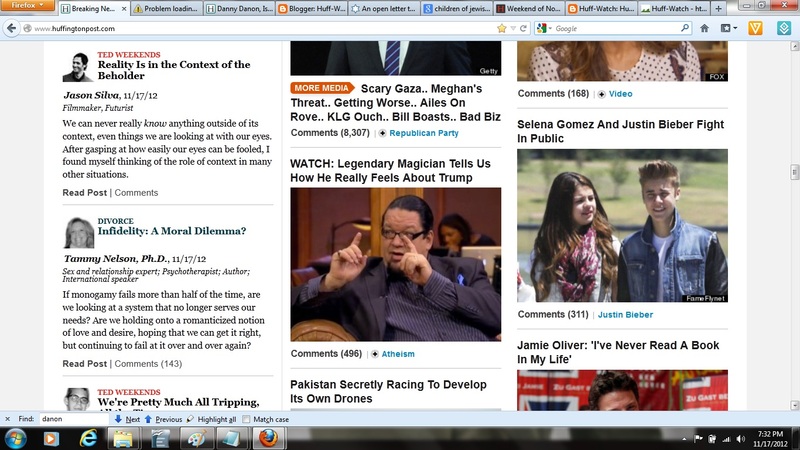 HuffPostLive completely ignored this threat, as well. HuffPostLive completely ignored this fact, as well. You get the idea. So how does this comport with Arianna's self-proclaimed guiding journalistic principle, though? So who is responsible for creating and managing "HuffPostLive"? HuffPost Live was co-created and developed by HuffPost's founding editor Roy Sekoff. Sekoff serves as President of HuffPost Live, overseeing all aspects of its ongoing development, production, and programming. HuffPost Live was co-created and developed by Gabriel Lewis, who now serves as its Executive Editor. The third member of the senior management team is Mitch Semel, Executive Editor of HuffPost Live.